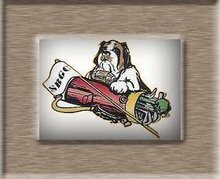 GOLFMAMA: Welcome back to St. Bernard G.C. Welcome back to St. Bernard G.C. It's official.... the 2011 season has started. We got the Chili open in yesterday despite the crummy weather forecast. After I rescheduled it from last weekend to this weekend, I was a bit nervous about the weather. But it turned out great , and we had a good turn out. 40 Golfers came out.... we golfed, partook in a few libations, and pigged out on Chili, cheese and crackers and other goodies. A big thanks to everyone who made a batch of their favorite chili recipe for the chili contest. 8 entries in all, and in the end Chili #4 (Jerry Schuster) was the winner. Chili #8 (Jerry Lopez) came in a close second. Good Cooking guys. I might put you to work here......yikes! I think everyone had a good time. I know Jake did. He's been laying around here all day just like a dog after a Thanksgiving dinner. No goose chasing today. Take a break buddy, you've earned it! We had quite a few new members participate in the competition, and I believe you the loyal followers made them feel welcome. Thank you to all who played. Also a big thanks to Wally and Pa John for their help in making the day run smoothly. Thanks to Linda and Therese for taking care of things in the clubhouse so I could go out and compete in the match. What would I do without my girls?! Speaking of which..... we have a new addition to the St. B crew/family....Dottie. Dot's first day was today, she followed Judi around learning the lay of the land, and getting broke in the only way you can here......SINK OR SWIM.....Oy! She handled it like a trooper. Even the fact that our day started out with Judi's first day back having a bird fly into the window while she checked out the scores from the tournament (Ouch! ) What a way to start a day?! New girl enters........ Dottie: "Ok, what can I do to start?" Judi: "Clean up on the porch" Dottie: "Ok, where's the shovel?" What a trooper........Welcome Dottie. It's cooled off and rained here, so I think I will lock up and head home now. Have a great rest of the day everyone. Look forward to seeing you soon.